The public is invited and encouraged to attend the Jefferson Terminal District (JTD) Vision Meeting on Wednesday, October 17, 2018 from 6 p.m. – 8 p.m. at the Armory Art Center, located at 811 Park Place in the City of West Palm Beach. The JTD is a diverse mix of warehouses, office, retail, residential, and government uses on approximately 183 acres in the City of West Palm Beach. The JTD is the area bounded by Okeechobee Blvd., Parker Ave., the Stub Canal, Interstate 95, and Australian Ave.
“Jefferson Terminals” is a historical name dating back to the early 20th century. An original plat name in the district, local newspapers as early as 1926 advertised land for sale in the Jefferson Terminals area. These advertisements prided the area on being “centrally located in the very heart of the city” and conveniently located near air and rail. Maps of the area from 1952 show that, while much of the land in the district was purchased for warehouse uses as advertised in the 1920s, a mixture of commercial businesses and residential homes was spread throughout the area. Historical property cards show how the localization of warehouses and factories lent to modest, workforce housing around the more industrial uses. An homage to the historic past and extensive mixture of uses that emerged in subsequent years, the name Jefferson Terminal District is fitting to describe this area and highlight the similar reemergence of this eclectic district. The JTD has recently experienced significant growth. Analysis of the area shows that—in the last five years—building permit activity has tripled, and the number of business licenses issued has quadrupled. Given the JTD’s proximity to transit, proximity to downtown, and enhanced employment potential with recent business growth in the area, it is expected this area may continue to grow. The Jefferson Terminal District study will provide an opportunity for a community vision to direct future growth in the form of a Master Plan. After identifying the need for a full study of the area, City Staff prepared a presentation for the City Commission in May 2018 to get approval to Master Plan the area. A Master Plan is a tool for responsible management which culminates in an overall concept or vision for a particular area. A Master Plan is like a road map. It will chart a hopeful course between the present and some intended destination, with milestones along the way. The process includes looking at the area holisticaly (urban design, mobility and infrastructure) while providing a structured framework for input from multiple perspectives. This is an integrated process through productive communication to look at the past, present and future of the area to analyze if policy modifications may be needed. Just a few of the benefits of the Master Plan include community-led visioning of the future of the area, coordinating and prioritizing actions with both the City and private sector, and improving cross-departmental coordination for budgeting projects in the area. The Master Plan will not inhibit the growth that has been happening organically. It will integrate physical development with the City’s policies, assist with infrastructure coordination, support business development, build on assests, and address challenges of the area. The Jefferson Terminal Master Plan will create a road map for district-wide renewal. The City does not have any predetermined outcomes for the JTD. As of October 2018, the City is conducting only public outreach, with the goal of creating a Master Plan for the area based on the input of our residents, neighborhood, and the community. The City welcomes participation in the planning process for the JTD. A public visioning meeting for the JTD will be held on Wednesday, October 17, 2018, at the Armory Art Center. 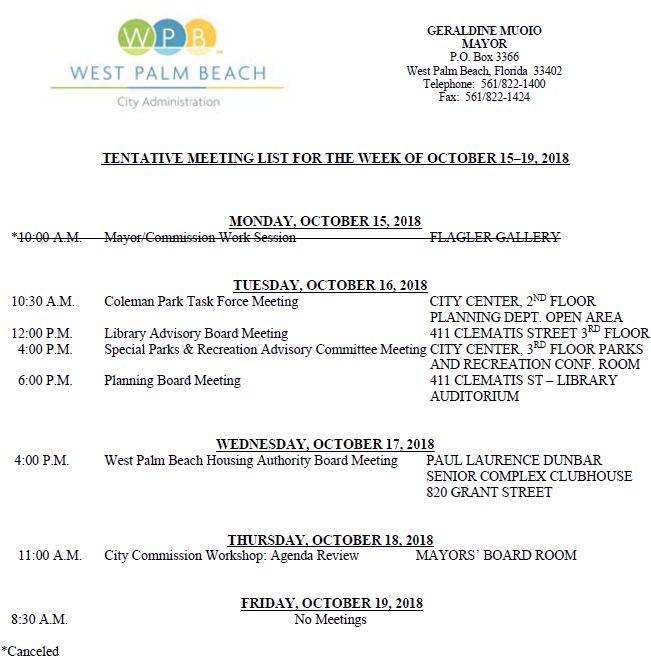 Visit http://www.wpb.org/JTD to keep updated on other upcoming meetings and opportunities for public participation. Here, you will also find a story map that tells more about the project and features a survey on the district. Additionally, you can email JeffersonTerminal@wpb.org with any questions or comments. The City of West Palm Beach is providing support to those affected by Hurricane Michael. City of West Palm Beach Emergency Operations Director Asst. Chief Brent Bloomfield of the West Palm Beach Fire Department has been deployed to the State of Florida Emergency Operations Center (see photo). The West Palm Beach Fire Rescue Department has also deployed two firefighters to the Urban Search & Rescue Task Force in North Florida to assist with rescuing victims. Assistant City Administrator Scott Kelly is chair of the Florida's Water/Wastewater Agency Response Network (FlaWARN), the formalized system of "utilities helping utilities" to address mutual aid during emergency situations. West Palm Beach water and wastewater crews are standing by in case their help is needed during the recovery. We are proud of our team and proud to support our fellow Floridians at this time. As a part of the City of West Palm Beach’s Vision Zero: Safe Streets for West Palm Beach initiative, Mayor Jeri Muoio, West Palm Beach Police Chief Sarah Mooney and West Palm Beach Fire Chief Diana Matty partnered with the Florida Department of Transportation to celebrate Walk to School Day by educating Belvedere Elementary School students and parents on the benefits of walking and biking to school. Walk to School Day, held annually around the world, raises awareness about the need for safe routes for walking and bicycling and emphasizes the importance of increasing physical activity among children. The day encourages active transportation and, where needed, brings attention to changes that may be necessary, so that people can safely walk or ride their bicycle. The Vision Zero initiative, which was unanimously approved by Commissioners in August, provides a framework for reducing and eliminating traffic deaths and serious injuries for motorists, bicyclists and pedestrians, while increasing safe, healthy, equitable mobility for all. As a special way to celebrate the day, Mayor Muoio surprised ‘Jack the Bike Man’ a.k.a. Jack Hairston by presenting him a ceremonial key to the City and proclamation in recognition of his commitment to bicycle safety and generosity toward West Palm Beach residents. Mayor declared Octover 10, 2018 as 'Jack the Bike Man' Day. The City of West Palm Beach will host a ribbon cutting ceremony at Dreher Park on Wednesday, October 17th at 3:30 p.m. We'll be celebrating the new replacement playground on the south end of the park. The public is invited! Come help us celebrate! Mayor Jeri Muoio, the City of West Palm Beach, and the Community Redevelopment Agency (WPB CRA), will officially unveil the much-anticipated new look of Clematis Street on Thursday, November 1 with a ribbon cutting and street party celebration in the 300 block beginning at 5:00 PM. The celebration will continue at the City’s Clematis by Night event from 6:00 PM to 9:00 PM. The unveiling marks the completion of the first phase of the Clematis Streetscape project that took place over the summer months throughout the 300 block of Clematis Street between S. Dixie Highway and S. Olive Ave. The project is transforming the city’s most iconic downtown street with a variety of modern infrastructure and vibrant design elements that renew and enhance the street with a pedestrian focus for residents and visitors. The public is invited to attend the ribbon cutting and street party and be among the first to experience the brand-new look of the first redesigned block. Guests can enjoy a family-friendly celebration with live music, giveaways, and more. Downtown businesses on the block will also offer special discounts, giveaways, tastings and other activities for guests during the street party. Then, the party moves down the street to Clematis by Night, the City’s weekly waterfront concert at the east end of Clematis Street, with lots of food, drinks, live music and fun. The 300 block of Clematis Street will officially open to traffic on Friday, November 2. Spruce Ave. between 36th St and 35th St. (Monday, October 15, 2018 – Tuesday, October 30, 2018: One side of Spruce Ave. will be closed alternately for curb, sidewalk and driveway replacement. Flaggers will assist motorists within the work zone. Olive Ave. between Datura St. and Clematis St. (Tuesday, October 16, 2018 – Wednesday, October 17, 2018): Full closure between 9:30 a.m. and 4:00 p.m. for crane use. Pedestrians will be escorted around the work area on the west side of Olive Ave.
Rosemary Ave. north of Fern St. (Monday, October 15, 2018 – Friday, October 26, 2018) will be closed for utility duct work. Detours provided, and traffic maintained on Evernia St. and Fern St. throughout the construction period. Cumberland Dr. (through January 2019): Reduced speeds on the eastbound and westbound lanes between Military Tr. and Village Blvd. for a road beautification and safety project.Flaggers will assist motorists. Clematis by Night (October 18, 2018, 6:00 p.m. - 10:00 p.m.): Road closures on N. & S. Clematis St. between Narcissus Ave. and Flagler Dr., and Narcissus Ave. between N. Clematis St. and Banyan Blvd. GreenMarket (October 20, 2018, 6:00 a.m.- 3:00 p.m.): Road closures on N. & S. Clematis St. between Narcissus Ave. and Flagler Dr., Narcissus Ave. between Banyan Blvd. and Clematis St., Lantana Ave. between Banyan Blvd. and N. Clematis St.
Okeechobee Blvd. from Chillingworth Dr. to Spencer Dr. (Monday, October 1, 2018 – Friday, November 2, 2018) will have the outside westbound lane closed, 9 a.m. until 3:30 p.m., Monday through Friday, for underground wire installation.